246 pages | 44 B/W Illus. 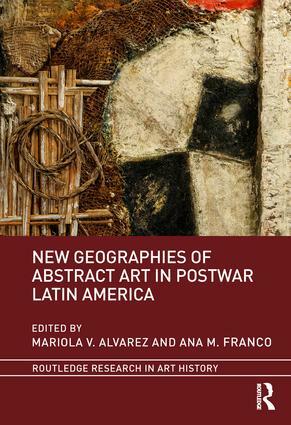 This edited volume examines the history of abstract art across Latin America after 1945. This form of art grew in popularity across the Americas in the postwar period, often serving to affirm a sense of being modern and the right of Latin America to assume the leading role Europe had played before World War II. Latin American artists practiced gestural and geometric abstraction, though the history of art has favored the latter. Recent scholarship, for instance, has focused on geometric abstraction from Argentina, Brazil, and Venezuela. The book aims to expand the map and consider this phenomenon as it developed in neglected regions such as Central America and the Andes, investigatinghow this style came to stand in for Latin American contemporary art. "Informalism Between Surrealism and Concrete Art. Aldo Pellegrini and the Promotion of Modern Art in Buenos Aires during the 1950s"
"Calligraphic Abstraction and Postwar Brazilian Informalist Painting"
"The Painting Devoured: El Techo de la Ballena and the Destruction of Venezuelan Informalism"
"The Fotoforma Exhibition at MASP, 1951: Geraldo de Barros and the Museum-School"
"Negotiating Afro-Brazilian Abstraction: Rubem Valentim in Rio, Rome, and Dakar, 1957-1966"
"Fighting for the Abstract: Manuel de la Cruz González and Geometric Abstraction in Costa Rica"
"Beyond Abstraction: The Work of Vicente Rojo, Kazuya Sakai, and Manuel Felguérez during the 1970s"
"Andean Abstraction as Displayed at the Organization of American States"
"The Politics of Abstraction in Colombian Art during the Cold War"
"Public ‘Lifescapes’: Gonzalo Fonseca’s Designs for Life and Play (1964-1969)"
"From Sacrilegious Black to Chromatic System: The Argentinean Monochrome"
"Antagonistic Environments: Gendered Spaces and the Kinetic Installations of Colombian Artists Feliza Bursztyn, Jacqueline Nova, and Julia Acuña"
"Vontade Construtiva: Latin America’s Geometric Abstract Identity"
Mariola V. Alvarez is Assistant Professor at Temple University. Ana M. Franco is Associate Professor at Universidad de los Andes, Bogotá.